The Skinny: Light and funny action comedy featuring a charming Michelle Yeoh and scads of well-choreographed, entertaining action. 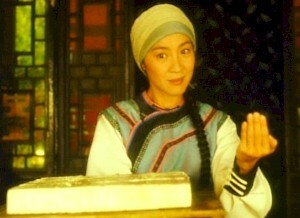 by Kozo: Queen-of-kicks Michelle Yeoh is Wing Chun, tomboyish proprietor of the local tofu stand. She gets involved in a Three's Company-type mistaken identity crisis when her childhood love (Donnie Yen) reappears and mistakes the beautiful young Miss Soybean (Catherine Hung) for Wing Chun. Causing even more problems are the amorous affections of a rich, but daffy scholar (Waise Lee). Also, bandits bother everyone, and their boss (Norman Chu) likes Wing Chun, too. Hell, apparently everyone likes Wing Chun. And there's fighting.